A weekly feature in which we're trying to find most compelling, best acted, written, directed and just generally great scenes that we've seen recently. Sharon Seymour: Emma wakes up next to the pot-guy and can't remember what happened last night. Funny scene! Darth Locke: Jack Crawford saves Hannibal's life after nearly being murdered via hanging due to Will enlisting a more than willing orderly. Justyna Kubica: It seems like only tragic things happen lately on TV. Which is why this scene feels even more special to me. I've been a fan of this couple for years now so it was such a fantastic and a very happy moment to watch. 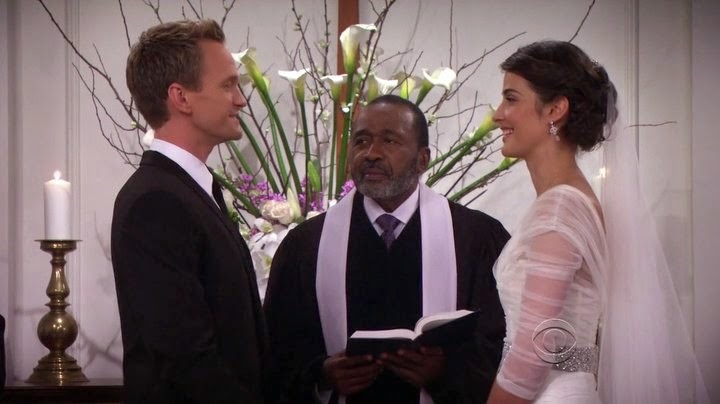 As much as I enjoyed the scene earlier, when Barney promises Robin to be honest with her and they embrace, finally ready to get married, the wedding was done so beautifully that I had to pick it as one of my favorite scenes of the week. First of all, Ring Bear! I'm glad it went so lovely, personally I kinda wanted to see the flower gorilla, but well... It was good to see so many familiar faces on the wedding and everyone being happy for the couple, including Ted, who finally let go of Robin and was rooting for his friends. I'm glad. I wish them all a happy ending in the series finale and can't wait to see Ted meeting the Mother. Something tells me it's gonna be an amazing scene. I already miss the show. Pablozky21: Ted tells Robin he doesn't love her anymore: The moment finally came down; after letting Robin go in "Sunrise" Ted has given the final step as he finally gets the chance to tell her that he doesn't love her anymore once he turns down Robin when she freaks out. 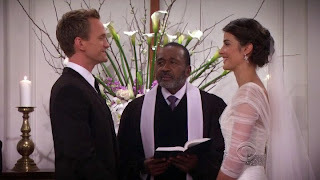 Robin considers Ted to be the safest choice, and that's why she tells him they should be together, but Ted knows she actually loves Barney and he realized that he doesn't love her as he thought he did, he just needed to hear Robin to tell him that she should be with him and then he was good to go. Klutzy girl: Juliette opens up and tells Avery how she feels about him. I love the way he tells her not to be jealous and that he would never destroy her. It was such an amazing, adorable conversation that made me love the pairing even more. Bradley Adams: Root tracks down Greer using Bear. Justyna Kubica: And Psych is officially over! It's so hard to say goodbye to such a fantastic show. I loved watching and re-watching the series, it somehow always made me feel better whenever I needed it. But if it's the end, I'm glad it went like this. I think it was pretty much a perfect ending for everyone. I was wondering which scene to pick, because I also loved Shawn's goodbye videos to Gus and Lassie, and Gus going after Shawn to San Francisco, but I think the proposal might be the best one. Not just because of the happy couple, but also because it shows how Shawn changed over the years, how much Juliet AND Gus mean to him, and it's the final scene of the series. I have to say, I'm so happy Gus wouldn't let go of his best friend! I was preparing myself for their "break up" but it didn't happen. Good! Cause I can't imagine those two apart. 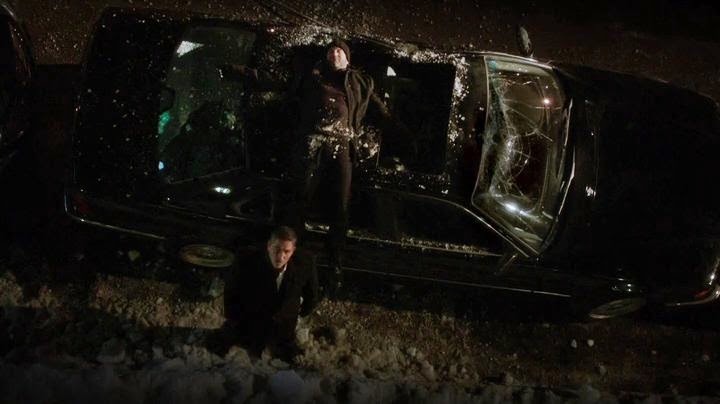 And now they can start over with their business in SF, maybe even joining forces with Monk (I loved this reference!) and eventually grow up. But never completely. "Will you marry us? Me. Mostly me." Farewell Psych! Goodbye to Shawn, Gus, Juliet, Lassie, Henry, Chief Vick and everyone else. You'll be missed dearly. Kudos to the cast and crew for all their wonderful work in this one of a kind show! Psych OUT. Virginia Fontana: Emily agrees to let Jack help her in her latest plan against Pascal. I am excited to see these two team up and have more scenes together. It should be fascinating to see Emily deal with having Jack in the action since she usually strives to keep him out of it. Pablozky21: This scene I choose because of how well crafted it is; it is as simple as Emily being publicly exposed for her fake pregnancy and she has to run away. It's a moment of soapy perfection, especially when she runs down the stairs and the laugh from the opera can be heard in the background. It is just so beautifully simple and well constructed that it easily became one of my favorite scenes of the week. And it became even better once Emily reveals she set the whole thing up, not that there was any doubt, but confirmation makes it all the more delightful﻿. 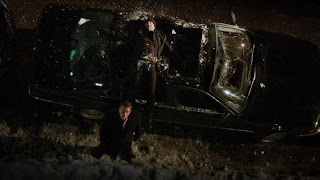 Pablozky21: It's been a while since I truly enjoyed a Scandal episode, mostly because I felt that every episode has been so fast paced that they are too overwhelming to actually enjoy them, but this episode managed to mantain the fast pacing a little bit more balanced and many scenes can be fully enjoyed, such as this one, in which Fitz calls out Mellie for destroying their marriage; they actually loved each other once, but once Mellie was raped by Fitz' father she just couldn't do it anymore, and the fact that Fitz puts the blame on Mellie without knowing this fact makes the scene both tragic and poignant, probably one of the highlights of the season for me. Justyna Kubica: The best season of one of my favorite shows finished this week. Now we have to wait another 3 months to see what's gonna happen next. I'm actually happy about that. I was afraid it's gonna be a much longer break. And so many great scenes in this finale! I honestly did not know which one I liked best. I decided to go with the last confrontation with Nogitsune or how I like to call it: Stiles vs "Stiles" showdown. I love the fact that working as a team is what made our heroes win with the seemingly undefeatable enemy. Everyone had their part to play in the plan. Derek, The Twins and Chris (thanks to Allison's idea) killed the Oni, Kira and Scott changed and destroyed Nogitsune's body, Isaac trapped what's left of him and finally Stiles (with Lydia's support) figured out how to beat him and his illusions in the first place. The Divine Move! I felt so proud to see them succeed, especially after all the losses they suffered (one still before them at that point). Not to mention the cruelty of Nogistune's final plan, to force Stiles to take his own life with the help of his best friend. And just to win a game with him! Good to see him gone! Still, Nogitsune was probably one of my favorite villains on the show, truly scary, effective, dark and clever. And so wonderfully portrayed by Dylan O'Brien who had spectacular season. I loved the final battle and the entire episode built around it and I can't wait to see what's gonna happen next. Thank you to the entire talented cast and crew for their incredible work this season. And to everyone not returning next season: you'll be dearly missed! Jamie Coudeville: I absolutely loved this, how long has he known?? I hope this means he'll get more screentime in season 4. Bradley Adams: Reddington meets with Mr Kaplan at the grave. Tonya Papanikolas: Van Pelt & Rigsby's last send-off scene in the hospital was a nice goodbye. I loved that all the characters said farewell to the couple as they prepared to go live as "civilians." We even saw Cho smile! 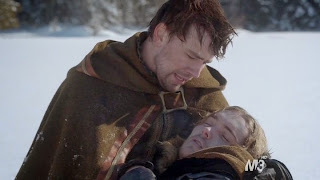 Sandi wich: Another episode where it was hard to choose a best scene as every character had so many little moments that shone, but this little scene is probably the one I've seen most fans mention over the past week. The dialogue was hilarious, yet still filled with the dire consequences they faced, and Tom Burke and Santiago Cabrera's energy and pace conveyed the frustration I think both characters felt over the enormity of what had happened. I love how little scenes like this show how close the Musketeers actual are, a lot is said and understood between each other without words, but with looks and nods instead. Virginia Fontana: I'm not sure Stephen knows what to think about his uncle or the Founder right now, which is excellently suspenseful. I'm loving how complex the Jedikiah character is, constantly shifting from seeming evil to showing a good side, and all of it interlaced with sincere emotions we can't always quite put our finger on. Jamie Coudeville: This can't have been easy for either one of them. They do need some time apart but I know they'll reunite by the end of the season. 21. Student. SpoilerTV Writer. Loves Movies, TV Shows (Supernatural, Doctor Who, Fringe, Person Of Interest, Arrow, Psych, Teen Wolf, Merlin, Sherlock, Once Upon A Time, Sleepy Hollow etc.) and Books (Harry Potter!). Fantasy&SciFi geek! Scene Of The Week articles author. Member of SpoilerTV team since 27th November 2011.